Books, graphic novels, illustrations, posters. After my Gettysburg panels, I did seven drawings of other battles. Most were completed in ink in a style similar to contemporary newspaper engravings or color lithographs (deadline 2-4 weeks). One was done in colored pencil because of a tighter (three-day) deadline. In each I focused on aspects of the battle that were unique to interest non-military history fans but added enough fighting to satisfy reenactors and war fanatics. Federal soldiers carry a wounded comrade while muskets ignite a fire in the surrounding brush. Sight-seers from Washington clog the roads behind the lines as the Federal army begins to route. Won an illustration award from the MDDC in 2000, the contest was judged by the S.C. Press Association. The first federal soldier to cross Confederate lines was from Maryland. In the background USCT manuevered in support of the operation. 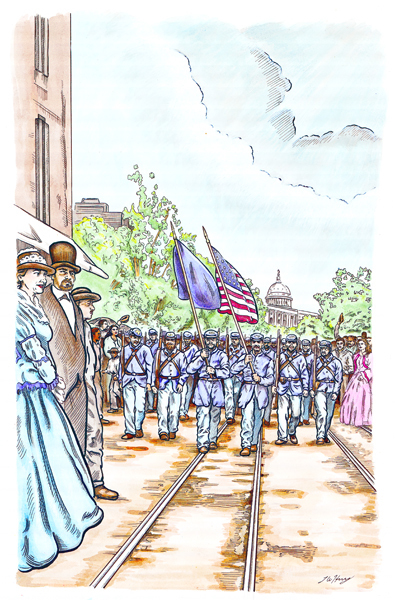 The Union army marches in Washington D.C. after the surrender of the Confederacy. The Maryland regiment that fought with Lee at Gettysburg. Their charge was led by their mascot.